Fire crews responded Wednesday afternoon to a home on West New Market Road to douse a field fire, and no damage was reported beyond a large circle of blackened grass on the property. The property owner said he was burning trash and the fire took off into the field. Firefighters quickly got the blaze under control using water hoses and leaf blowers. 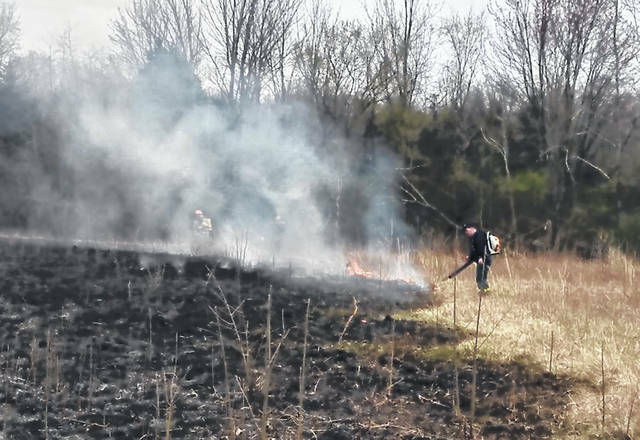 Lt. Branden Jackman of Paint Creek Joint EMS/Fire District, pictured in the photo, said Ohio is under a burn ban between March, April and May. During that time, open burning, including in burn barrels, is not allowed between 6 a.m. and 6 p.m., Jackman said.